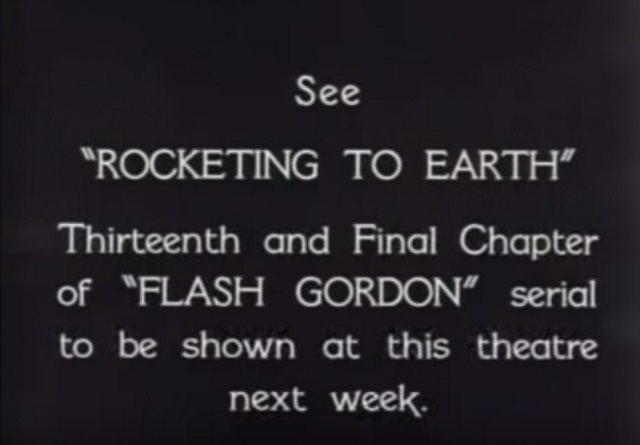 It’s Saturday so it must be time for the penultimate chapter of the Flash Gordon Rewatch. At the end of the last chapter we left Dale being attacked by a Tigron (that’s a tiger to you and me). Baron and Flash reach Dale just as she is attacked by the Tigron and, no thanks to Baron, Flash manages to kill the beast. Baron advises Aura that she should bond with Flash by helping him, rather than trying to kill the woman he loves. It’s a crazy idea but it might just work and Aura agrees. Meanwhile, Vultan and Zarkov are subdued by Ming’s guards. Zarkov is ordered to divulge the secret of his invisibility machine but refuses. Aura offers to take Flash and Dale back to her father and convince him to set them free. She takes them to Ming’s throne room and true to her word, Aura stops Ming from capturing Flash. Somewhere along the line Ming gets the impression Aura likes Prince Baron and he agrees that they should live in peace – at least until the earth men leave. To Zarkov’s distress Ming’s men destroy the invisibility machine (which is apparently the flimsiest piece of equipment ever designed and falls apart with one tap). Ming declares that he is happy for Flash and the others to go home. Flash and Dale are taken to the laboratory to free Zarkov and Vultan. Flash isn’t convinced of Ming’s sincerity and everyone agrees they should leave as soon as possible. Zarkov contacts Earth again and has just enough time to tell them they are preparing to return home. Vultan invites the Earthlings to his kingdom where they’ll be safer and even Aura agrees. They decide to leave secretly but Ming has already ordered they be watched closely and Baron is spotted loading the rocket ship. Zarkov contacts Thun (the lion man from the beginning of the series) and they arrange to meet him at Vultan’s palace. Thun immediately sets off in his spinning top. Baron has arranged to meet the others at the turret house at the Lake of Rocks. As Flash arrives at the rendezvous point they see Baron’s rocket ship but he opens fire on them, trapping them in the turret. See what they did there? Has Baron really turned evil? What is the excellent surprise Ming has planned for them? That’s probably the most random chapter so far. I’ve got no idea why Aura is suddenly hooking up with Baron, why they’re going to Vultan’s palace and what role Thun plays in whatever they have planned. But hey, it’s Flash Gordon so I don’t care. It’s not particularly clear why they want Thun to go to Vultan’s palace but I guess they want a big reunion for the final episode. 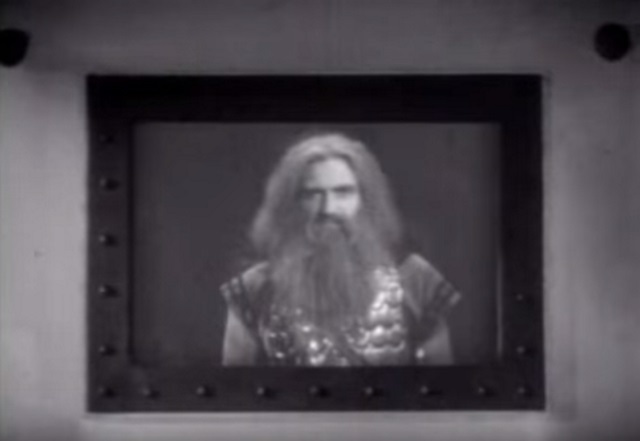 Zarkov clearly forgets to hang up the videophone thingy though and leaves Thun hanging. Dale gets favourite character honours this week for a) fighting off a tiger and b) not fainting. Only one more episode to go so join me next week for Chapter 13 – Rocketing to Earth. My homage to Flash Gordon, Glitch Mitchell and the Unseen Planet, is available now. For a limited time you can pick it up on all ebook platforms including Amazon US, Amazon UK, Amazon Canada for just 99c. The paperback edition is also as cheap as I can make it – $10.95. 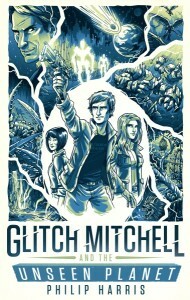 I suppose that every serial has at least one episode that is the weakest and for me it is this one. Other then the exciting start where Flash saves Dale from certain death at the hands of the deadly tiger, it seems to go a little dry. I agree with you by the way. Why does Prince Barin stand back and not assist Flash with the Tigron? It is extremely unlikely that one man could take on a large Tiger and emerge victorious. I guess the writers wanted to show how capable the hero really is here. While the cliffhanger ending is not a bad one, it still appears to be the weakest of the entire serial.